I grow this tender looking Fuchsia thymifolia in the shade. It's semi woody branches arch up to 3 feet and carry numerous 1/4" blooms. I use it for the fine foliage texture and the beautiful small flowers that carry a familiar shape and a distinctly unfamiliar setting. Fuchsia thymifolia is so different from the large, often blousy, flowers of the popular hybrids. 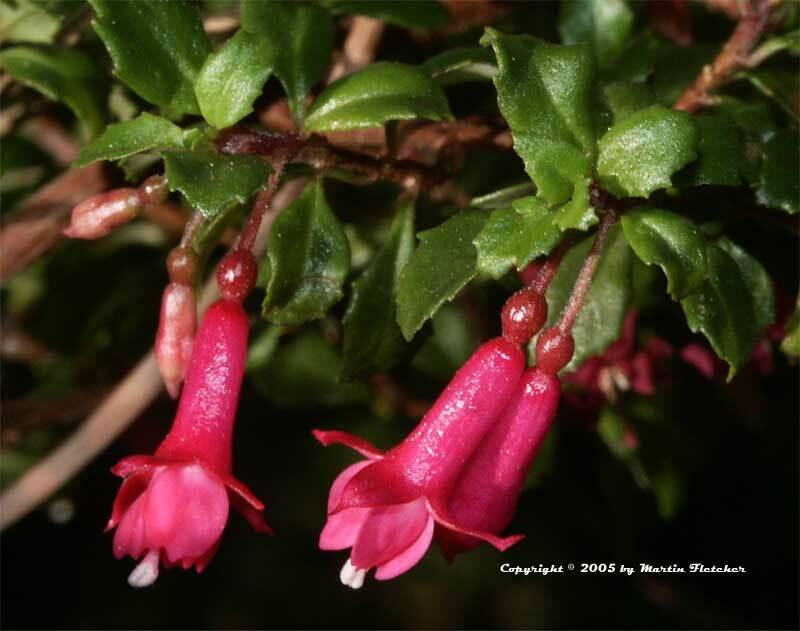 Fuchsia thymifolia will be damaged by frosty nights that fall below 25° F and killed in the low 20°s F. Fuchsia thymifolia grows well in a low to moderately to well watered garden. Flowers and foliage of Fuchsia thymifolia Thyme Leafed Fuchsia. High resolution photos are part of our garden image collection.